In splendid isolation: the Beudon winery near Fully sits high above and separate from neighbouring vineyards, making it easier to grow organic grapes. Update: just after I posted this, Jacques Perrin’s latest blog post arrived, about the course I followed last week. It’s in French, but for anyone who reads French, it’s a good review of some of the current thinking about the use of cement eggs, amphores, etc. Correction: Writer Wink Lorch was good enough to remind me that Rudolf Steiner was not Swiss but Austrian. He died in Switzerland, but that hardly makes him Swiss. I’ve just returned from 3 days in northern Spain, a wine trip to Ribera del Duero for sommeliers and wine writers from Germany and Switzerland (French- and German-speaking areas). English was used most of the time because it was the most widely shared language, but the variations on terms used for wine language, and people’s levels of English, varied. A couple of recent conversations with two colleagues in the wine writing business, both of whom reviewed my new book, made me pay closer attention to this, and reminded me of the misunderstandings that can arise. Pierre Thomas was one of the writers on the trip, a Swiss French language wine writer I’ve known for several years. He published a review 12 October of my newvbook Vineglorious! 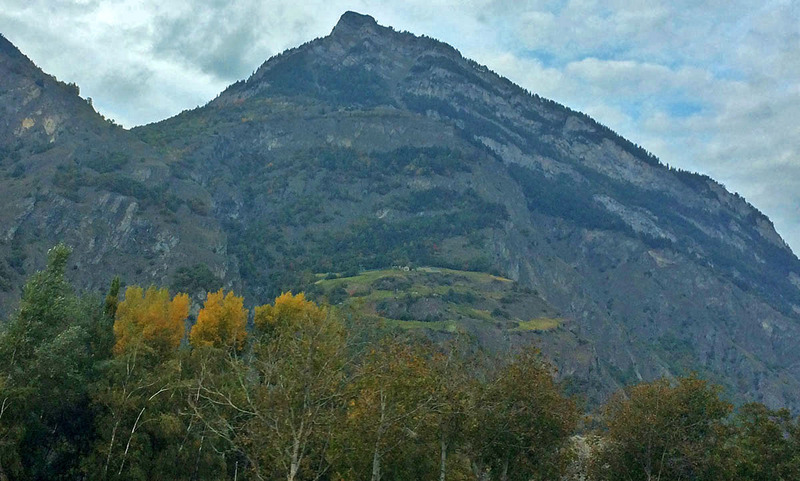 Switzerland’s Wondrous World of Wines, and the trip gave us a chance to discuss it. His review is positive, but he criticized at length what he saw as a mistake about biodynamic wines. I pointed out that it is not an error, but rather that he misinterpreted the sentence. Unfortunately, from his understanding of the text he assumed I don’t know much about biodynamic winemaking, which is not the case: it’s an area I find particularly interesting. 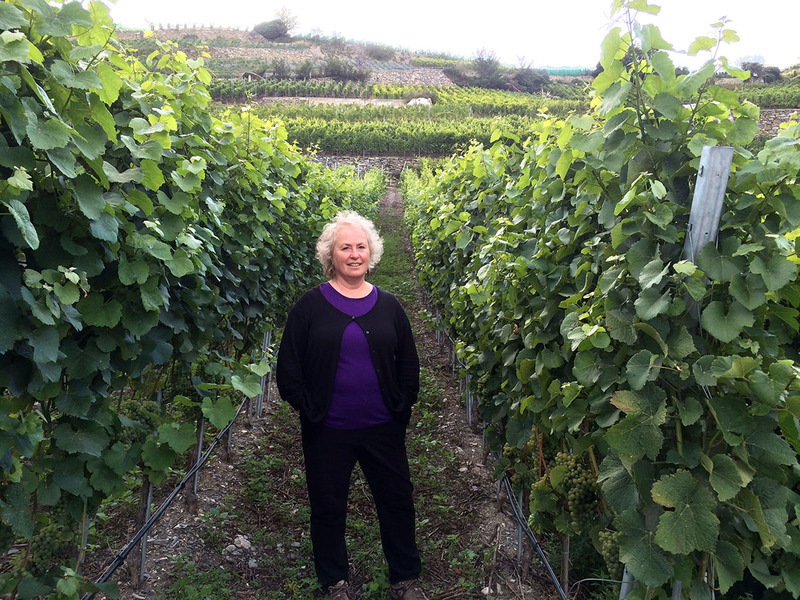 “Demeter is a Swiss biodynamic label”, appears on page 102 of Vineglorious!. If you’ve read the previous page, with “Vinatura is a quality label for integrated production (IP)” and “Bourgeon’ is a Swiss quality label for organic wines”, you’ll probably have understand that the Swiss, among others, use Demeter as a biodynamic label. It is not a Swiss-only label, which is what Pierre thought I was saying, and it is not the only name used for biodynamic wines in Switzerland, but it is far and away the most widely used label. Also, Demeter is not limited to wine: the label is used for other food and drink products. And as Pierre Thomas points out, Rudolf Steiner, an Austrian who died in Switzerland (a feeble link), is the grandfather of biodynamic practices, and he is in the long list of references for the book, which will soon appear online, after the index, which is going up this morning. You’ll also realize, when you see the references, that while Jancis Robinson et al’s Wine Grapes was clearly a source for the 52 grape varieties described in the book, it is not the only one. It would be a disservice to José Vouillamoz, one of the authors of that book, to imply this, because he kindly took time to proofread and edit my grape variety references – with a certain amount of discussion between us at times! I believe it’s important to have a specialist for this complex field, where our knowledge has been shifting rapidly thanks to DNA-based research, and Valais-based José is an international expert. Robert McIntosh also wrote a review in the past few days, upbeat and positive. He sent me, privately, a list of suggestions to consider if at some point I reprint. The more sharp readers the better, I think, so I was pleased to see this. One point intrigues me, and I’d like to share it with you, for discussion. Riddle: what is egg-shaped, made of concrete, red on the inside when it is happy and gray on the outside, and lives about three to five times as its cousin, made of wood? I replied to Robert that as this alternative to maturing wines in oak becomes more widespread, I am seeing the word “amphoras” (which conjures up an image for most people, whereas concrete eggs is puzzling to a neophyte) used as a generic, broad term. This seems to be happening in conversation and in writing for a general public, rather than for more advanced wine consumers who expect precision. He is technically correct, but usage shifts over time. “A blog post” is now common usage, but it irritated early bloggers, the techies, because it was redundant: you blogged. Maybe we’re both right; maybe he is. In any event, the photos indeed show cement eggs, as he says. 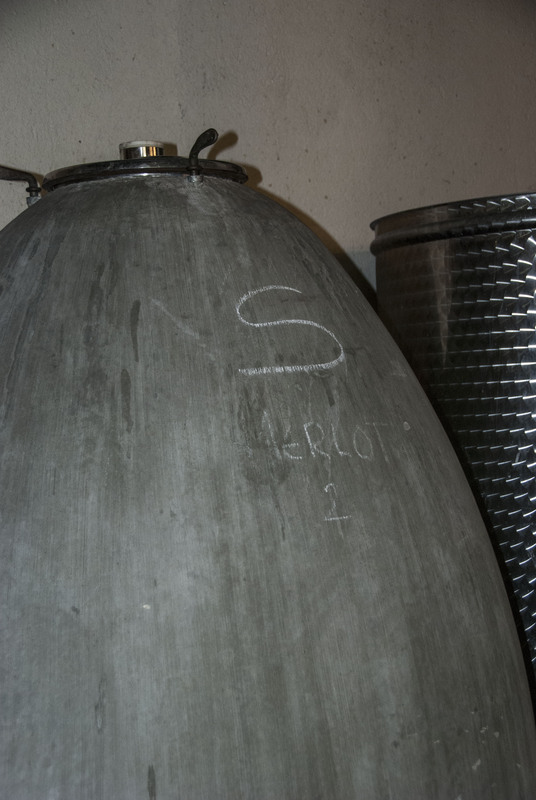 Here are a couple of examples of usage, one by Pierre-Emmanuel Buss, a wine writer at Le Temps, in French, and another from the Drinks Business in 2011, early days, where they are called egg vats. A firm in the US that makes concrete tanks labels them “Amphora”. During my visit to Spain I heard two German sommeliers talk about amphoras, but when pressed it turned out they were talking about concrete eggs, and they certainly knew the technical difference. At a course I attended last week we looked at square concrete eggs, poor Mother Hen! as well as polymer eggs that remained true to Mother Hen in shape. Here is a link to a Napa Valley winery that does a good job of explaining and using the terms correctly, and a related question that writer Stephen Tanzer posed, to different wine producers in several countries. I had not really considered that concrete egg fermenting vats were on the same spectrum as amphorae – however I understand the point. I have to say that from my own perspective it is not a helpful combination. There is a big difference in my mind in the wine making styles and philosophies between those who choose to use “amphorae” and those who use “concrete egg vats”. One of the key features of making wine in amphora is not just the shape of the vessel, but that it is generally minimal intervention – possibly with an element of oxidative style (call it Orange, Natural, etc. ), while concrete eggs are really one more tool or technology for the interventionist winemaker, albeit in a more delicate way. Amphoras have no cooling systems, pumps, access doors, taps. It may be that I am behind the time. However, in an area that is already FAR too complex for consumers to understand, I would say that linking the two under the same title is actually muddying the waters rather than being helpful. Why not keep the two ends separate, admitting there might be grey areas in the middle, rather than put the burden on the reader to understand the nuance? I wonder what Simon Woolf would say … I shall ask. You might be convincing me 🙂 Would love to hear what others think and will be asking over the next few weeks. Oh, and for the record, the issue with blog posts is not that people use the term “blog post” which is fine, but that this is shortened to “blog” when they mean “post” … The blog is both the platform that binds all the posts, and the activity (to blog is to publish on a blogging platform), but the individual atom in this case is a post. In journalism terms, the post is the article, the blog is the publication. You create a post ON a blog. You do not ‘create a blog’ unless you are starting a new collection of posts; a new publication. Agree with Robert, calling concrete egg-shaped tanks for amphorae is a disservice to wine lovers. Amphorae or not concrete and are not egg-shaped and, as Robert says, are usually used with different objectives in mind than using “egg tanks”. As the eternally geeky wine editor, I feel obligated to make a pedantic interjection in a post titled “wine language” as well as its subsequent discussion. The plural of “amphora” is “amphorae” and certainly not “amphores”. “Amphoras” is often accepted as the anglo-saxon plural of “amphora”. Whether one choses the Latin “amphorae” or the Anglo-Saxon “amphoras” is a matter of style – and one can demonstrate style by using one or the other. Vessels for grape juice/must/wine say nothing about the amount of intervention in winemaking techniques. One could make an orange wine in a number of vessels, not just amphorae. And one could, for example, disinfect the fruit with sulphur-dioxide, add cultivated yeast, or filter the juice/must, before entry to an amphora – just as in any other vessel. I also have a suggestion for explaining wine-growing categories. Whether Controlled Integrated Productuion or Organically Grown, a third-party certification is required. The third party certification agencies are numerous, ranging, for example in Switzerland (as you have mentioned), from Demeter to Vinatura, etc. Despite third-party certification agencies that vary from country to country, the basic categories of conventional viticulture, IP, and organic are defined by the OIV and internationally recognised. <it would be a mistake to confuse one particular certification agency for a complete category. Amphores was a typo, my apologies as I should have caught it but I see it too often in French. I’m the author of a popular international English style guide for schools and amphora/amphoras is correct in today’s world, as is amphorae, I agree; there is a continuing trend to anglicize plurals for several Greek and Latin words, with the original versions now appearing pompous to people in some countries. I write the plural of chateau with an s, while some people keep the French x: both are correct, a question of style. I think your last paragraph offers a very helpful reminder of categories vs. certification, thank you. As to your last paragraph, I think you are overstating the case for how generally accepted and standardised things are. As far as I am aware OIV does not have a definition of “organic”. If they do I would be very interested and grateful if you could give a reference to it. In fact, I’d say that there is no international and generally accepted definition of what “organic” means. Just as an example, “organic” means quite different things in Europe and in the US. I’d say that the same thing goes for the other categories, except that they are even less standardised than “organic” (biodynamic and culture raisonne as examples). That’s not necessarily a bad thing. It is better to have some rules than no rules. In Europe we have chosen to let the certification for “organic” be done by semi-offical third party organisation, like Ecocert. I am not so sure that is the case in the US where I think it might be the USDA itself that gives the stamp. For culture raisonne (if that is what you mean with Integrated Production) the situation is less clear and much less standardised. But I certainly do agree that it is a good thing to keep separate the “category” and the names of the certifying organisations, although it is not always easy, especially when we are outside the organic category. If you’re at the DWCC event in Montreux, I’ll be doing a signing session, Saturday, I think. See you then!